THE HUMAN RIGHT to housing is explicitly set out in the Universal Declaration of Human Rights, the International Covenant on Economic, Social and Cultural Rights. Yet here we are in the 21st century and still this basic human right is being denied to thousands of people throughout the North. There must be radical changes to the way housing is dealt with in the Six Counties. It is totally unacceptable that people should live in overcrowded conditions similar to the late 1960s. It is unacceptable that the number of people deemed homeless in this city sits at 1,900 and that another 1,330 are on the Housing Executive waiting lists. For this generation of young people there is insufficient social housing. As they mature and look forward to having a family and living in their own home, they will find that they may never be offered a house in the social housing market. They may be forced to enter the private rented sector, where the rents tend to be higher and the security of tenure tends to be poorer. If there were enough social houses for them, the problem would be resolved. To address the shortfall in available and suitable housing, Minister for Social Development Nelson McCausland, who has responsibility for housing, needs to take immediate steps to significantly increase the housing stock. Urgent action needs to be taken to secure people’s right to have adequate shelter and standard of living in a safe and healthy environment. If it was not for immediate and extended family, more people could be living on the streets. This problem really took root in the mid-1990s when the British Government took away from the Housing Executive the right to build. This was a mistake and one that needs to be reversed. Instead of giving the Housing Executive back the right to build, however, it looks like the Department of Social Development is in actual fact running the Housing Executive down. 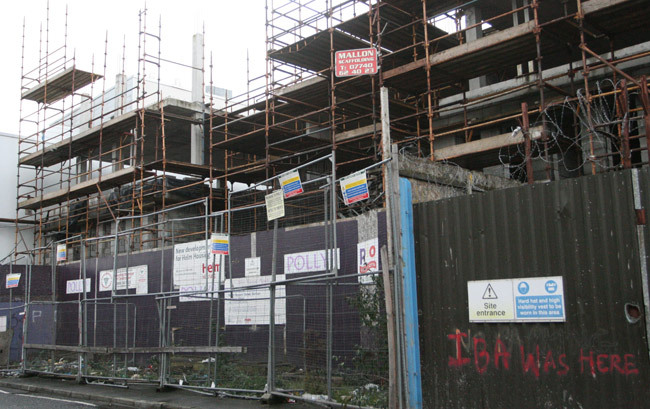 The Department of Social Development (DSD) has allowed a number of housing associations to take over Housing Executive stock in both Derry and Belfast. The DSD and the Housing Executive have stated their intent to transfer more Housing Executive properties over to housing associations here over the course of this financial year as the Housing Executive do not have the money to carry out maintenance on these homes. What is the future of the Housing Executive in the North over the next ten years? For those who find their own private rented temporary accommodation, a failure to award people the additional 20 points they would be entitled to for being six months homeless is a major penalty. With new builds non-existent within the Housing Executive, all this leads me to believe that the Housing Executive will be nothing more than a rent collecting body with no other responsibilities in the very near future. It is our responsibility to ensure that this does not happen and that all our people have not just the right to a home but to have a home.